Signal to noise ratio is a pretty important factor in the world of electronics design, especially in Rf and analog design. Strangely enough, it’s also a critical part of marketing. In many parts of the engineering community, the term “Marketing” essentially has a similar definition as the term “deception.” Point of fact, that is not the definition of the term. But a low signal to noise ratio can make it seem so. Fundamentally, marketing is about getting factual information to people who need it to make an informed decision. Deception is bad marketing. Just as designing a noisy amp is a lot easier than designing a clean, low noise amp; noisy, unclear and even deceptive marketing is a lot easier than is good marketing. That’s why you see so much bad marketing. It’s easy. But we’re not here for “easy.” We’re here for accurate and important. Creating high signal to noise ratio marketing doesn’t involve grounding and filters. Well, maybe it does. Just a different type of grounding and filtering. Keep yourself emotionally grounded and filter out what’s not important. It requires an understanding of what is important to your potential customers and the ability to differentiate between that and what’s important to you. If those are the same thing, you are luck, but they’re rarely exactly the same thing. Hopefully, there is some overlap. If not, you’re likely trying to sell the wrong thing to the wrong people and that’s never a good thing. What you need to look for is overlap, and you need to understand your customers in order to find that overlap. That may very well be one of the most difficult concepts for an entrepreneur to fully grasp: just because it’s important to you, doesn’t make it important to anyone else. What you need to look for is overlap between what you do and what your customer needs to know to make an informed decision. That overlap is the key. It’s not about what you want to say. It’s not about telling someone what they want to hear. It’s about the overlap of what’s accurate from you and helpful to them. 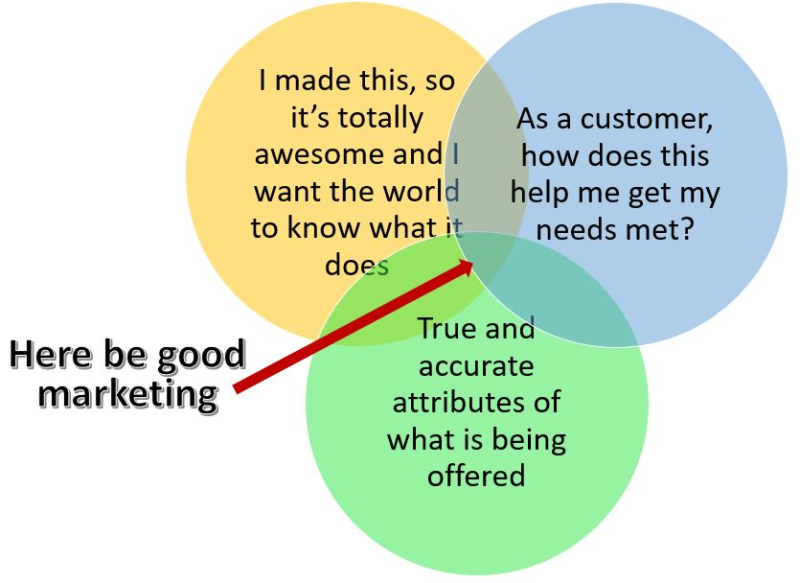 If it doesn’t help a potential customer understand how it will help them or isn’t accurate, it’s not good marketing.